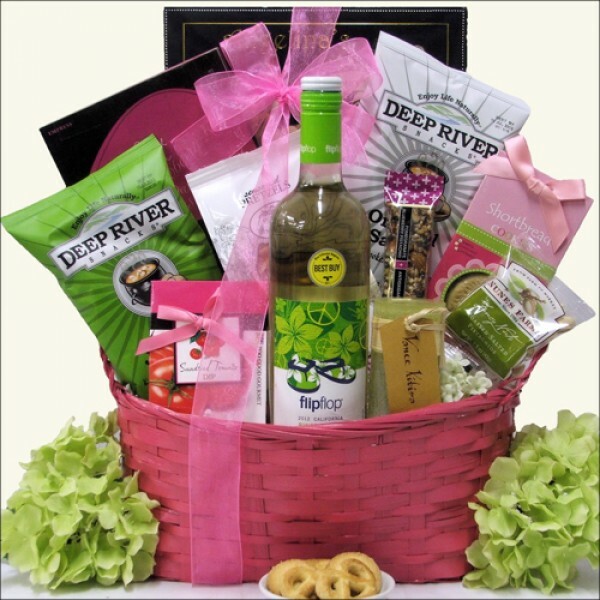 Send this bright and cheery 'Flip Flop Pinot Grigio' Wine Gift Basket for any occasion. This basket includes a bottle of refreshing and crisp Flip Flop Pinot Grigio White Wine, plus Too Good Gourmet Sundried Tomato Dip, East Shore Seasoned Dipping Pretzels, Chocolate, Cookies and more. All this packaged in a Pink Bamboo Indoor Lined Planter Gift Basket. ...in a Pink Bamboo Indoor Lined Planter Gift Basket.